Chinese economic growth is the primary driver of the evolution of global commodity market demand. Energy markets are no exception. China consumes 47% of global coal production and Chinese gas imports are projected to account for around half of global LNG demand growth this decade. But a manufacturing slowdown and increasing risk of a credit crunch may put the brakes on Chinese growth with significant implications for gas and coal markets. Chinese economic growth is the primary driver of the evolution of global commodity market demand, as we have highlighted previously. Energy markets are no exception. China consumes 47% of global coal production and Chinese gas imports are projected to account for around half of global LNG demand growth. The manufacturing sector, the engine room of the Chinese economy, is shrinking again. There are some concerning early warning symptoms of a credit crunch in an economy where growth has been propped up by credit expansion. Optimists point to China’s ability to manage these risks through a centrally planned solution. But both these issues are side effects of previous bouts of central planning: industrial overcapacity from fiscal stimulus in the case of manufacturing weakness and monetary stimulus in the case of credit growth. The extent to which the Chinese authorities can ‘manage’ growth and asset bubbles is likely be put to the test over the next 12 months. The outcome will be of key importance to commodity markets. 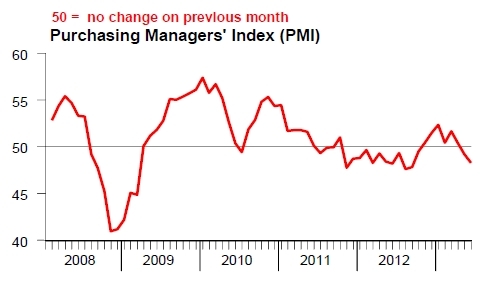 Since we last wrote about Chinese manufacturing growth, there has been a minor recovery as the eurozone crisis eased in the second half of 2012. But the recovery has been short lived, with a sharp fall over the last 3 months back into negative territory as shown in Chart 1. 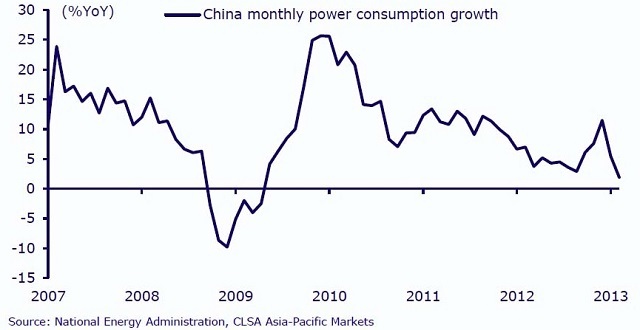 Evidence of a slowdown is supported by a decline in Chinese power consumption (now at its lowest level since 2009) shown in Chart 2, a key factor behind weakness in the global coal market over the last two years. 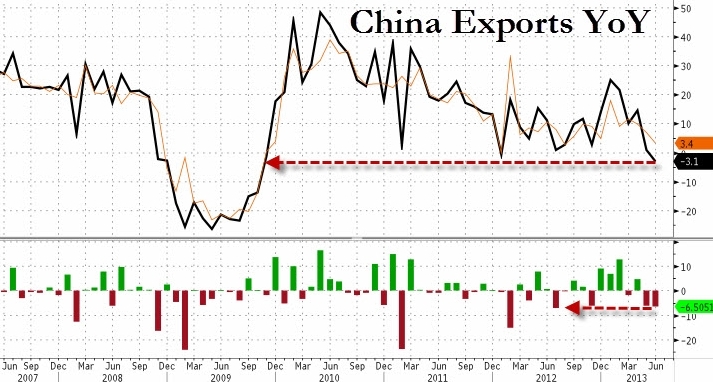 And a decline in Chinese exports shown in Chart 3.
Credit growth has been a key central planning tool used by the authorities in China to ‘control’ its recovery since the onset of the financial crisis. The rapid credit expansion since 2009 is clearly illustrated in Chart 4. 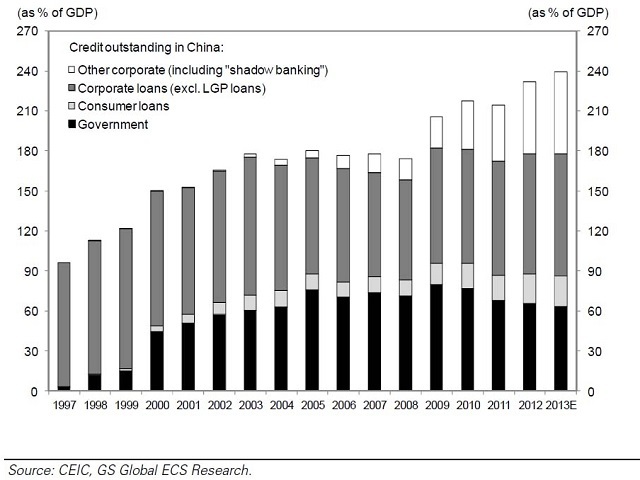 Incremental credit growth has been focused in the poorly regulated shadow banking sector (i.e. non-bank financial intermediaries), an issue which the authorities have recognised as a risk they intend to address. The first real hint of the side effects of this rapid credit expansion emerged in June 2013 with a sudden spike in stress in the interbank lending market in China shown in Chart 5. This is somewhat reminiscent of the LIBOR issues that signaled the onset of credit stress in the USD interbank market in 2007-08. While China has acted quickly to inject liquidity to bring down interbank rates it faces a tough balancing act. 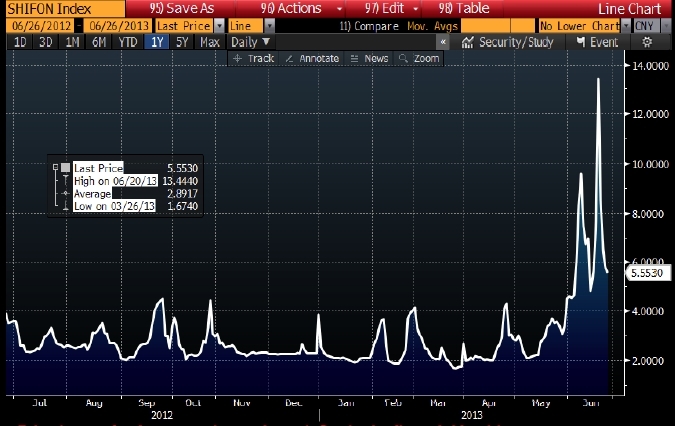 The more the authorities support liquidity now, the worse the risk of a more serious credit crunch in the future. This is a problem which the authorities appear to be aware of based on their tolerance for interbank rates to settle at higher levels since the initial spike. Credit contagion threatens to damage the Chinese economy much more quickly than a manufacturing slowdown. China has made it clear that it does not intend to enact another major fiscal stimulus package like the one in 2009 given the risk of fueling further imbalances in the economy. So as manufacturing slows and credit issues intensify, China’s central planners are running out of options to support growth. The energy industry has become accustomed to the impacts of consistently high levels of Chinese demand for coal and gas. There is certainly a compelling long run story around China’s requirement for energy imports. But the current risks to China’s economic growth may warrant a review of ambitious assumptions on Chinese energy demand growth over the remainder of this decade.